Virtually every waste transport organization has specific processes and systems to enhance its operations. Excoffier Recycling in France is no exception. The company uses Trimble’s telematics solution for navigation, task and vehicle management as well as sending information and photos of its fleet operations in real time back to its office. “We chose Trimble for its customisable and easily configurable tools. Their solutions are a perfect fit for our requirements,” said Christophe Caen, operations director at Excoffier Recycling. For three years, Excoffier Recycling’s 110 trucks have been using Trimble on-board computers, most of which are CarCube devices with a large screen and driver interface that is fixed to the dashboard. The large amount of data gathered only requires data to be entered manually on an ad hoc data basis to optimize operations. The fill rate of voluntary waste collection bins, for example, is automatically populated to the Trimble system, and is available in real-time to the fleet manager. This feature has a direct bearing on invoicing. “Anything that can be done immediately and without data re-entry improves our efficiency, productivity and reliability,” said Caen. 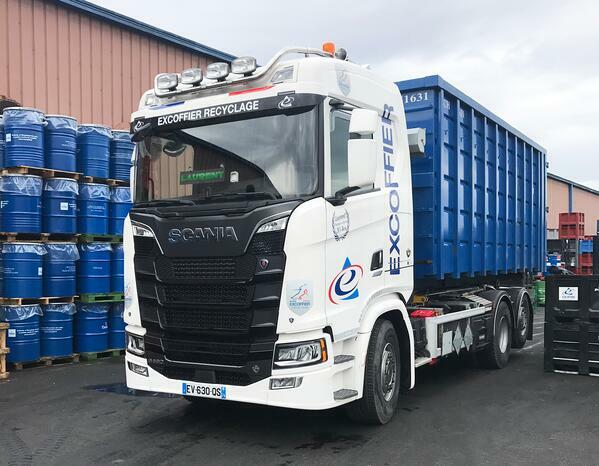 A regional leader in waste collection in Savoie and Haute-Savoie (France), Excoffier Recycling has a turnover of €70 million and employs 330 staff, including 110 haulage drivers. The company provides 700 services per day, a total of 15,000 per month.